My, but how the children are growing up so fast; faster than a Golden Snitch, I'd say. When we started our adventures of the boy wizard, Harry was just a little boy. Now, he's the leader of a secret society preparing for battle against the monstrously evil Lord Voldemort (murderer of his parents) and Voldemort's coven. We now have Harry (Daniel Ratcliffe) back at the Dursleys and suffering a terrible loss. 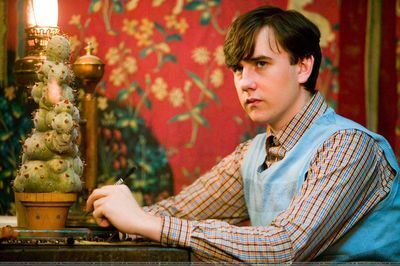 Not only does he have to endure the taunts of his cousin Dudley (Harry Melling) but attacks from Dementors while in the Muggle world. It is his self-defense that gets him into trouble: expulsion from Hogwarts, much to the delight of his Uncle Vernon (Richard Griffiths) who cheers the news by saying in the typically cartoonish Dursley manner, "Justice!" as though he were having a stroke. Back in the Wizarding World, Harry learns about the Order of the Phoenix, a secret society created a generation earlier to fight against He-Who-Cannot-Be-Named. Potter has one chance to not just return to Hogwarts but to not face prison for using magic in the Muggle world: a trial where Dumbledore (Sir Michael Gambon) comes to his defense, much to the dislike of the Minister of Magic Cornelius Fudge (Robert Hardy). At Hogwarts, Harry rejoins his friends Ron Weasley (Rupert Grint), Hermione Granger (Emma Watson), and a new classmate, a rather eccentric, ethereal girl, Luna Lovegood (Evanna Lynch), along with another classmate from the previous films, Neville Longbottom (Matthew Lewis). We have a new-new-new-new Defense Against the Dark Arts teacher, one Dolores Umbridge (Imelda Staunton), a woman who oozes a pseudo-sweetness and Jackie-O wardrobe and works for the Ministry of Magic. Soon, under the guise of 'education reform', becomes the Hogwarts High Inquisitor, where she issues edict after edict restricting what is taught, read, done, worn, culminating in the firing of Divination Professor Sybill Trelawney (Emma Thompson). Seeing that Umbridge is more interested in making Hogwarts over in her image than in doing any actual instruction, Harry and his classmates form what they call "Dumbledore's Army", where they will learn fighting techniques in the foreseen battle against Voldermort and his minions. Umbridge takes umbrage at what she suspects is unsanctioned student activity, so she creates an Inquisitorial Squad to uncover who is in this 'army' and where they meet, a mysterious location known as The Room of Requirement. As Potter continues training his classmates and developing romantic feelings for fellow student Cho Chang (Katie Leung), they learn that Bellatrix Lestrange (Helena Bonham Carter), cousin to Sirus Black (Gary Oldman) and murderess of Neville's parents, has been broken out of Azkaban. Among the hijinks the Weasley twins unleash on the prudish and pompous Umbridge, we also have Bellatrix and Lucius Malfoy (Jason Isaacs) luring our group to the Ministry of Magic for a battle against not just them but Voldemort himself (Ralph Fiennes), leading to a hollow victory for Harry. In Order of the Phoenix, Michael Goldenberg (filling in for regular Potter screenwriter Steve Kloves) has to mix two stories: the fight against Umbridge's coup at Hogwarts and the training to battle Voldemort. While the stories were mixed well, at times one felt that the original book by J.K. Rowling must be so vast and sprawling that one felt that, even at two hours and eighteen minutes, the film was both extremely long and yet leaving out a great deal. It is a credit to Goldenberg and director David Yates that they melded on the whole effectively well. The regular cast is consistently good: Ratcliffe channeling the anger within Harry and Grint continuing to bring his mix of clumsiness and heroics to Ron. Rickman has a slightly expanded role as Snape, continuing to bring a severity to Severus. His interpretation is one of a contained anger, and we finally (albeit briefly) are given a backstory as to why he has such a hatred for the Potter family as a whole. The new cast members show themselves to be welcome life to this series. Lynch has this otherworldly quality to her Lovegood, a girl who knows she is ostracized but who just soldiers on, who has a wisdom far beyond her years. Bonham Carter seems tailor-made for the role of Bellatrix, bringing a mix of danger and eccentricity to this dangerous and unstable character. Stauton's Umbridge is a sharp mixture of an extraordinary character, who from the moment we see her know her facade of sweetness really masks a heart of stone. Her pink outfits and soft voice, down to her chambers with plates of precious cats, would indicate a matronly, genteel woman, but in her various edicts and commands after commands she seems to mirror a fascist, dictatorial creature. It is difficult to say Longbottom is a new character, given that Lewis has been in all four previous Potter films, but here, he actually has a major part in the plot. It's almost as if Longbottom is someone similar to Harry in that both were made orphans by forces of evil. In all the other films, Longbottom was a bit of a wimp and klutz, but here, he is actually heroic and in a sense he does become a new version of a previously comedic minor character. He still carries a bit of the insecurity and fear Longbottom has always had, but he also is one who is growing in confidence, enough to try to face off against a master witch like Bellatrix. That being the case, some of the other characters are short-changed. Dame Maggie Smith is not on screen for long as Professor McGonagall, as is Robbie Coltrane's Hagrid. Faring worst is Tom Felton's Draco Malfoy, who had at the most two to three scenes. The nature of Order of the Phoenix is such that given the length of the story one could have cut these characters out of the story altogether without it affecting the overall flow of the film. I would argue that the Dursleys could have been cut as well. Harry could have been alone when the Dementors attacked him, and while such characters as David Thewlis' Remus Lupin (from Prisoner of Azkaban) might have been important in terms of the upcoming films, here, they seem out of place with little to do. 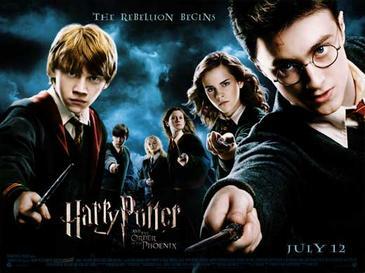 Overall, as fun as some of the rebellion Dumbledore's Army and romance between Harry & Cho were, they took things away from the central story of the rising of Voldemort and the Army's preparations for the battle. The battle scenes Yates creates lift the film up tremendously. The final confrontation between the forces of Voldemort and the forces of Potter/the Order is a long and exciting confrontation. However good the battles and training montages were, they are bogged down by some of the subplots like that of Hagrid's half-brother. I also disliked a variation of the Deus Ex Machina: the Room of Requirement (aka the Come & Go Room). Rather than find a place to train, the place finds them. How convenient. I also have a question about how "the Muggle Prime Minister has been alerted to the danger" when Voldemort's reappearance is finally and officially confirmed. It distracted me to think that the worlds of Wizards and Muggles is much closer than one thought they were in the beginning. Be that as it may, Order of the Phoenix shows that, in spite of how expansive the series is, one can still have an interesting and exciting film come from the Rowling novels. If it weren't for the appearance of the Dursleys (which has always been the weakest part of the Potter films), The Order of the Phoenix would have ranked higher. Given that, this is a strong film. At last Harry Potter is showing a bit of muscle.